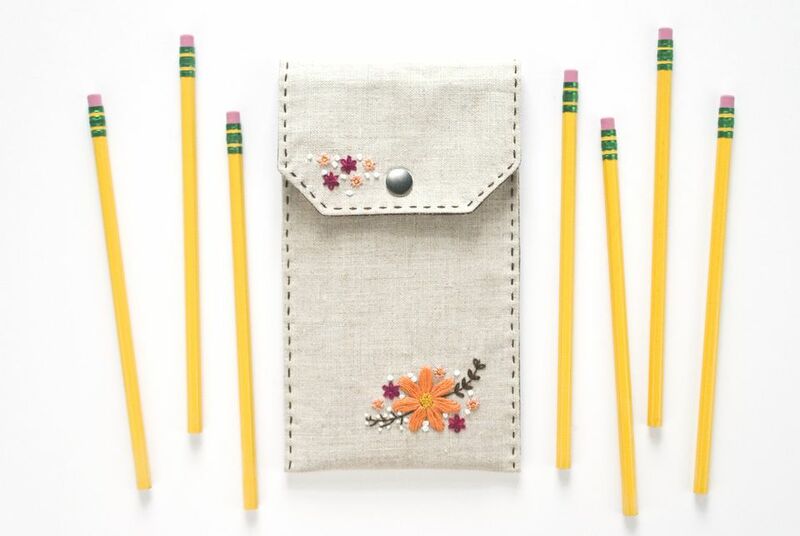 Whether you're preparing for back-to-school time or just looking for a way to store your pens, this embroidered pencil case is easy to make and will keep your supplies organized in style. The floral embroidery looks beautiful on a linen pouch, but this DIY is easily customizable with other patterns or personalized with a name. Plus, it sews up super quick! Read through all of the instructions before starting, then grab your supplies and you'll have your own embroidered pencil case in a snap. You can use any embroidery pattern you like for your pencil case, so the style can vary greatly. If you want to add the floral design shown, download the pattern page and adjust the size as needed. The larger motif should be no more than 4 inches wide. In the finished example, it is approximately 2.5 inches wide. For the floral design, try these colors from DMC: 4210 (Color Variations), 352, 922, 728, Blanc, and 839. Stitch the large flower with satin stitch petals and french knots for the center. Form the tiny flowers with two straight stitches for each petal and a french knot for the center. Work the branches with back stitch. Form the loopy flowers and the looped branch with detached chain stitch. For all of the teeny dot flowers, use loose french knots. Iron the fusible interfacing to the back of the linen. This will give your pencil case a bit of needed structure and stability. Mark out a 5 x 18-1/2 inch rectangle on the fabric. This will be the size of the panel you'll work with, but you don't want to trim it yet. Having the extra fabric around the edge makes it easier to place in an embroidery hoop. Trace or transfer your pattern within the rectangle. Folding the ends in will give you an idea of the placement for the front and flap. Keep the designs at least 1/2 inch from the marked rectangle. Use a rotary cutter and ruler to trim the linen rectangle and cut a matching piece from the dark fabric (dark fabric is less likely to show marks from pencils). On the end of the rectangles that will be the flap, trim 1 inch from the corners at a 45-degree angle. Place the two pieces right sides together and pin the edges. Sew around the sides with a 1/4-inch seam allowance, leaving a 3-inch opening for turning it right side out. This process is faster on a sewing machine, but you can stitch it by hand if you'd like. Trim the corners to reduce bulk, then turn the pouch right side out. Roll the seams open with your fingers and iron the panel. Make sure that the opening seam allowance is pressed in so the edges are even. Fold the straight end up, forming a 7-inch front for the pencil case. Pin the sides. Use three strands of embroidery floss and running stitch to sew the sides and top-stitch the flap. Start at the bottom and work all around the top flap and then down the second side, stitching 1/8 inch from the edge. Fold the top down and attach the snap to the flap and the front of the pouch, following the manufacturer's instructions. Make sure the two snap sides match up. It's helpful to fill the pencil case with pencils to get an idea of how far you want the flap to fold down. If you fold it down almost as far as it goes, it will only hold about 12 pencils. If you raise the flap a little, more will fit. Add your stash of pencils or pens, and you're ready to go back to school!